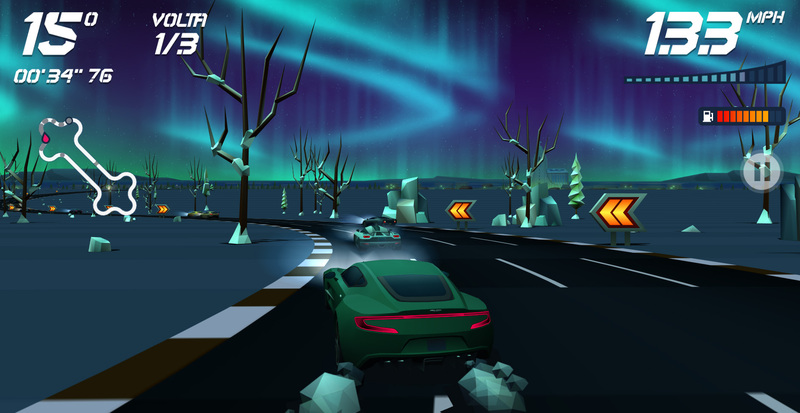 Aquiris Game Studio was on a mission with Horizon Chase (Free). They wanted to recreate classic racing games like Outrun, Top Gear, Jaguar XJ220, and others from the late-1980s and early-1990s, even getting the Top Gear composer, Barry Leitch, to create the soundtrack for the game. And oh, did they knock it out of the park. They’ve created a game that spectacularly recreates the feel of the racing games of 25 years ago, while abandoning the annoying aspects of those games, creating this wonderful hybrid that shows that they managed to create their dream game. This is an arcade-style racing game, with physics that aren’t necessarily entirely unrealistic, but definitely feature some canned responses to actions. Hit a wall and you’ll spin out. Don’t rear-end cars if you want to keep up your speed. You have several turbo boosts per race, must manage fuel, and can pick up tokens that help you unlock future levels. The feel of the cars, the look of the game: it all manages to feel like something I’d have played when I was a kid on my Genesis, but with a 3D low-poly style. The amount of content in this game is ridiculous. There’s nine or so tracks per country, and an exceptional amount of variety in the courses. The progression barriers are such that you’ll need to go back and do well on earlier tracks in order to advance further. Thankfully, there are rewards for doing well – finishing third in the bonus races earns you a fleet upgrade, and a new car for finishing first. Get a pro medal on each track in a country and you’ll get a new car, too. It could perhaps get a bit tedious over time, but it does keep getting more and more challenging as you play, and hey – the value for what you get is absurd. This could have been a more expensive game and still worth it. There’s no in-app purchases at all, either. The tracks do require you to play close attention to which car you use. There are cars that definitely play better on the straightaway-centric tracks, and handling-plus-acceleration cars will do a lot better on the twisty tracks. Even the distance of tracks plays a role in selection – having a car with better fuel efficiency may help you in a situation where fuel pickups are in tricky spots, or are spaced far apart. You can roll on empty until you stop, and I have managed to hit a fuel pickup in that situation, but it’s not an ideal strategy for finishing in first. The look of Horizon Chase is absolutely gorgeous. While we’re likely to see a revival of the PS1/N64 era low-poly style in the coming years – it’s starting with games like OmniBus – this game blends together a low-poly look with high-resolution clarity. And boy did Aquiris manage to pull off this contrasting modern-yet-retro vibe. The visuals are clearly lower-polygon-count models, but it’s a great stylistic choice. Plus, the colors used in the game give it this extremely vibrant and saturated look. The fact that it all runs at sixty frames per second helps it feel as good as it looks. Seriously, this is one of the most beautiful iOS games released in recent memory. Play it just because it’s gorgeous. The feel of the racing is fantastic, too. Again, there’s a definite old-meets-new contrasting vibe here that somehow works. It definitely manages to feel like an old-school racing game in the way that the courses work, the perspective, and even the physics. But the game being in 3D helps out a lot, because everything has a weight to it. The feel of Horizon Chase is definitely on the arcade-y side instead of the realistic simulation side, but knowing that you’re actually bumping another 3D car, and the presumptive weight of everything on the course? That makes everything feel so much better. While I wasn’t a fan of Top Gear, the soundtrack that the original composer of that and other similar racing games did for this game is a fantastic double-sided trick. Horizon Chase sounds great, creating an atmosphere that recalls the original era of those classic racing games, while also sounding unique: it’s a mixture of stripped-down rock styles with synthesizers that sounds old, but fresh. And because it’s by the original composer of those tracks, there’s that authenticity there. But it’s not just about having the name for this game, it really does help add to the vibe that Horizon Chase needed to nail. Controls-wise, you have left and right steering buttons, a gas pedal, and the nitro boost button. There are a variety of configurations, but the default placement worked best for me. There’s the occasional mis-tap issue where you might think you’re hitting one direction, and missed the button, but they’re pretty par for the course for virtual controls. The lack of braking is something you learn to work with through letting off the accelerator in turns, and letting downforce take over when necessary. The game does support MFi controllers, which is a fantastic addition – and necessary for a game going for that old-school vibe. They aren’t a requirement to play the game nor to do well at it, and I wish you could navigate the menu with a controller, but otherwise? Another welcome addition. 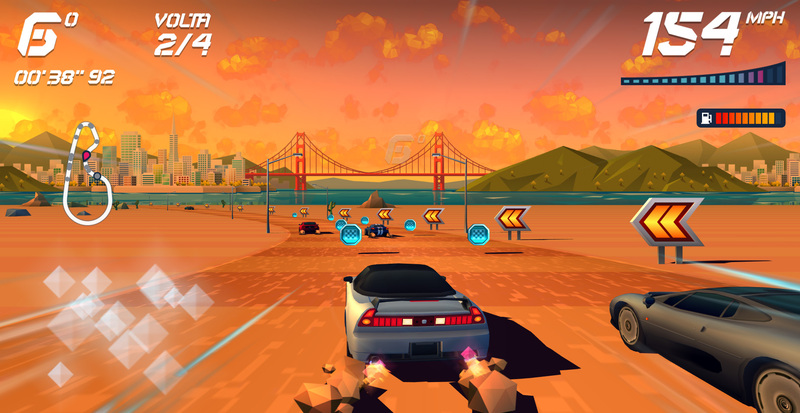 Horizon Chase is not just a fun racing game, it’s also a template for how other developers need to do retro-inspired games. It’s not about making a game exactly as it was, it’s about finding a way to recreate the feeling of the old games, while mixing in relevant parts of the advances in modern gaming. Aquiris did that in such a great way, that they made a game that feels great regardless of whatever it’s trying to crib from old-school games. Buy this game.